In this blog Dr Rob James, senior lecturer in history, reflects on the issue of ‘truth’ in historical feature films, revealing how filmmakers have frequently used past events to comment about contemporary situations. Rob specialises in researching people’s leisure pursuits, and teaches a number of units on film and the cinema, including his second year option unit ‘The Way to the Stars: Film and cinema-going in Britain, c. 1900-c. 2000’ and the final year Special Subject strand ‘Cinema-going in Wartime Britain, 1939-1945’. Historians and critics have regularly reacted in horror at the way filmmakers or television producers have depicted the past. This commonly revolves around two issues, both relating to historical accuracy, or more to the point, the lack of it. Loud shouts of derision have been made about the appearance of a wristwatch on a charioteer’s arm (in Ben Hur ), or the sound of collared doves cooing in nineteenth-century Britain (the birds weren’t introduced into the country until the 1950s). These are foolish mistakes, of course, but they don’t do any real damage. Film’s distortion of the past for ideological reasons is seen as more troubling, however. 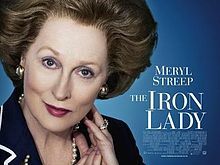 Why, the Daily Mail’s Chris Tookey howled in 2012, did director Phyllida Lloyd have to make Margaret Thatcher a feminist icon in The Iron Lady (2011)? Earlier in the century, Hugo Davenport and Stuart Jeffries raised their own concerns about films’ rewriting of the past as way of scoring political points. These are important matters, of course. If, as these critics argue, films and television are the only way the majority of people receive their history education, then distorting the past for political gain can have significant consequences. The international success of Henry VIII encouraged other British filmmakers to turn to the country’s past in order to comment on the contemporary situation, and later in the 1930s Herbert Wilcox made two hugely popular films covering the reign of Queen Victoria, who at that time had been Britain’s longest-serving monarch (Queen Elizabeth II surpassed that on 9 September 2015). 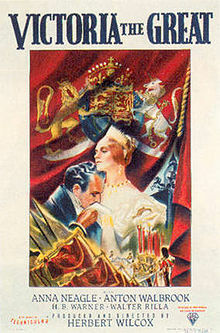 The first film, 1937’s Victoria the Great, was made as a response to the Abdication Crisis of the previous year. The crisis had rocked British society, with many people fearing it would threaten the country’s stability. Into the breach stepped Wilcox with his film aimed at bolstering confidence in the monarchy by celebrating Victoria’s long and (in Wilcox’s depiction) glorious reign. Wilcox’s second ‘Victoria’ film, Sixty Glorious Years, released in 1938, dealt less with domestic issues, focusing instead on overseas difficulties, namely the rise of fascism in Europe. The film was basically a call for national preparedness in the face of the growing menace emanating from Hitler’s Germany and Mussolini’s Italy (it was released just after the Munich Agreement of the same year). Britain’s historical past was thus being utilised to resolve contemporary problems. Korda and Wilcox may have bended the ‘truth’, but their distortions of the past were made as a response to what they perceived to be the needs of society at that time. The films’ popularity suggests that they were tapping the right nerve! 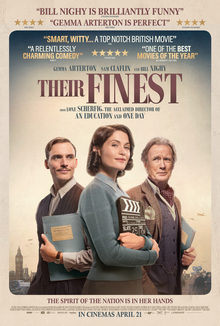 Of course, the real test for filmmakers came during the Second World War when the British film industry was utilised to help instil confidence in the country’s victory in the conflict (2016’s Their Finest, starring Gemma Arterton as the fictional propaganda film scriptwriter Catrin Cole, does a sterling job at portraying the government’s efforts to encourage filmmakers to use the medium in the national cause). As a result, Britain’s past was once again deployed to respond to contemporary issues. Films such as Thorold Dickinson’s The Prime Minister (1941), Carol Reed’s The Young Mr Pitt (1942), and Laurence Olivier’s Henry V (1944) drew on the activities of various British leaders – Benjamin Disraeli, William Pitt the Younger, and Henry V respectively – in order to boost the morale of cinema audiences. Gainsborough Studios, meanwhile, deployed British history to respond to the changing social mores of the period, and their films featured an array of female characters who participated in a whole manner of thrilling, often highly immoral, acts. 1945’s The Wicked Lady, for example, starred Margaret Lockwood as a seventeenth-century aristocrat who swaps her domestic drudgery for a life of excitement as a highway robber. Her impassioned refrain “I’ve got brains, and looks, and personality. I want to use them, instead of rotting here in this dull hole” would have spoken volumes to the millions of wartime women who had swapped their domestic chores for the experience of working in factories and fields as part of the war effort. James Chapman, Past and Present: National Identity and the British Historical Film (London. I.B. Tauris, 2005), p. 1. Hugo Davenport, “Imagining the Past”, BBC History Magazine, 6.1 (January 2005), pp. 36-37; Stuart Jeffries, “Hollywood does history”, The Guardian, 13 July 2005. Juliet Gardiner, The Thirties: An Intimate History. (London. Harper Press, 2010), pp. 114-117. Anthony Aldgate and Jeffrey Richards, Best of British: Cinema and Society from 1930 to the Present (London. I.B. Tauris, 2009). Martin Pugh, We Danced all Night: A Social History of Britain between the Wars (), London: Vintage, 2009), pp. 383-385. Chapman, Past and Present, pp. 64-90. 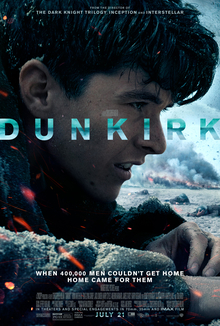 Rafael Behr, “Dunkirk has revealed the spirit that has driven Brexit: humiliation”, The Guardian, 26 July 2017 https://www.theguardian.com/commentisfree/2017/jul/26/dunkirk-brexit-retreat-europe-britain-eec.